In-house, service provider, or vendor coupons can be entered using TeleTracker Online’s Coupon feature. Coupons provide a way for employees to reduce the price of a product on an invoice in a trackable and secure way. Several reports show coupons including the Profit & Loss Reports and the Coupons Taken Report. To access Coupons from the menu bar of the main TeleTracker Online screen, click Master Files, then Coupons. To create a new Coupon, click on the New button located on the toolbar. 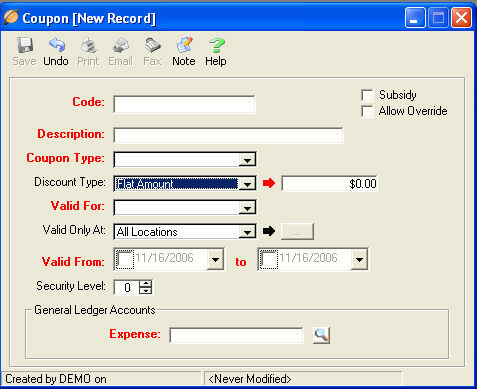 To open an existing Coupon, select the Coupon from the Coupon Master File list and click the Open button. Code : This field is the unique name used to identify each individual Coupon. Subsidy : This box will enable the program to calculate the subsidy discount after tax as opposed to the standard pre-tax coupon calculation. Allow Override : This box will enable the salesperson to enter an amount that changes the value of the coupon discount. Description : This field is used to further describe your Coupon code. Coupon Type : This field identifies the coupon issuer. When a Service Provider or a Vendor is selected as the Coupon Type, the issuer must be identified in the appropriate field. Discount Type : Select the appropriate Discount Type for the coupon. If Flat Amount or Percentage is selected, enter the appropriate value in the corresponding field. The Make Item Free option will create a balance of zero for the product when placed on an invoice. Valid For : Select the appropriate Valid For option. The Coupon will only be valid for the product(s) linked to this option. When selecting a Specific Product, Product Type or Department, enter the appropriate value in the corresponding field. Valid Only At : Select the appropriate locations for which this Coupon is valid. When selecting a valid location from the Valid Business Units window, move the ‘available’ location to the ‘selected’ field. Valid From : Select the appropriate dates for which the coupons will be valid. Security Level : Assign this field the appropriate security level a User must have in order to use the coupon. General Ledger Accounts : This field is required if you are Synchronizing with QuickBooks. If you are NOT synchronizing with QuickBooks populate this field with the provided default account: 9999-TELETRACKER SUSPENSE GL CODE. Please visit the QuickBooks help file for further information regarding your General Ledger Accounts and synchronizing with QuickBooks.